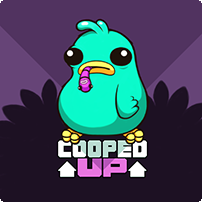 if you didn't guess already from the promo art around the site and the previous blog post, our new game 'Cooped Up' is now live on Apples App Store and the Goggle Play store. It should be live also on the Amazon App store any time now. It's the pricy price of freeeeeeeee so if you can afford that and have a pocket based computer thing you can go download it now! The game is also coming to the Nitrome site but there will be a delay on that. Hopefully a lot less than there was on Silly Sausage! Were sorry for the delay there we want to bring the games to all formats simultaniously but it's very hard to get everything to align and the web version is the most different. Hopefully as we get the Web GL stuff up and running we can work on getting the process a little more streamlined!